Summary: The placement of the Sabbath day in the week is important. Did the Creation week exemplify this? The first six days of each week are given to man for labor, because God employed the same period of the first week in the work of creation. On the seventh day man is to refrain from labor, in commemoration of the Creator's rest. But the assumption that the events of the first week required thousands upon thousands of years, strikes directly at the foundation of the fourth commandment. It represents the Creator as commanding men to observe the week of literal days in commemoration of vast, indefinite periods. This is unlike His method of dealing with His creatures. It makes indefinite and obscure that which He has made very plain. It is infidelity in its most insidious and hence most dangerous form; its real character is so disguised that it is held and taught by many who profess to believe the Bible. "By the word of the Lord were the heavens made; and all the host of them by the breath of His mouth." "For He spake, and it was done; He commanded, and it stood fast." Psalm 33:6, 9. 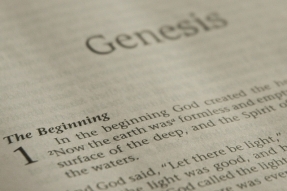 The Bible recognizes no long ages in which the earth was slowly evolved from chaos. Of each successive day of creation, the sacred record declares that it consisted of the evening and the morning, like all other days that have followed. At the close of each day is given the result of the Creator's work. The statement is made at the close of the first week's record, "These are the generations of the heavens and of the earth when they were created." Genesis 2:4. But this does not convey the idea that the days of creation were other than literal days. Each day was called a generation, because that in it God generated, or produced, some new portion of His work. Geologists claim to find evidence from the earth itself that it is very much older than the Mosaic record teaches. Bones of men and animals, as well as instruments of warfare, petrified trees, etcetera, much larger than any that now exist, or that have existed for thousands of years, have been discovered, and from this it is inferred that the earth was populated long before the time brought to view in the record of creation, and by a race of beings vastly superior in size to any men now living. Such reasoning has led many professed Bible believers to adopt the position that the days of creation were vast, indefinite periods. But apart from Bible history, geology can prove nothing. Those who reason so confidently upon its discoveries have no adequate conception of the size of men, animals, and trees before the Flood, or of the great changes which then took place. Relics found in the earth do give evidence of conditions differing in many respects from the present, but the time when these conditions existed can be learned only from the Inspired Record. In the history of the Flood, inspiration has explained that which geology alone could never fathom. In the days of Noah, men, animals, and trees, many times larger than now exist, were buried, and thus preserved as an evidence to later generations that the antediluvians perished by a flood. God designed that the discovery of these things should establish faith in inspired history; but men, with their vain reasoning, fall into the same error as did the people before the Flood—the things which God gave them as a benefit, they turn into a curse by making a wrong use of them. It is one of Satan's devices to lead the people to accept the fables of infidelity; for he can thus obscure the law of God, in itself very plain, and embolden men to rebel against the divine government. His efforts are especially directed against the fourth commandment, because it so clearly points to the living God, the Maker of the heavens and the earth. There is a constant effort made to explain the work of creation as the result of natural causes; and human reasoning is accepted even by professed Christians, in opposition to plain Scripture facts. There are many who oppose the investigation of the prophecies, especially those of Daniel and the Revelation, declaring them to be so obscure that we cannot understand them; yet these very persons eagerly receive the suppositions of geologists, in contradiction of the Mosaic record. But if that which God has revealed is so difficult to understand, how inconsistent it is to accept mere suppositions in regard to that which He has not revealed! "The secret things belong unto the Lord our God: but those things which are revealed belong unto us and to our children forever." Deuteronomy 29:29. Just how God accomplished the work of creation He has never revealed to men; human science cannot search out the secrets of the Most High. His creative power is as incomprehensible as His existence. This article is from Patriarchs and Prophets: 111-116.